Raymond Carver's fiction is widely known for its careful documentation of lower-middle-class North America in the 1970s and 80s. 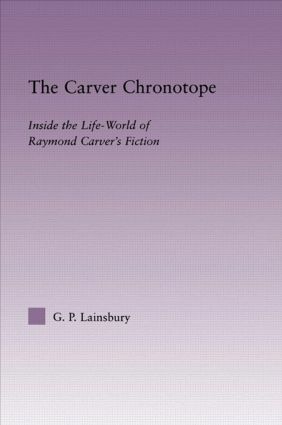 Building upon the realist understanding of Carver's work, Raymond Carver's Chronotope uses a central concept of Bakhtin's novelistics to formulate a new context for understanding the celebrated author's minimalist fiction. G. P. Lainsbury describes the critical reception of Carver's work and stakes out his own intellectual and imaginative territory by arguing that Carver's fiction can be understood as diffuse, fragmentary, and randomly ordered. Offering a fresh analysis of Carver's body of work, this book offers an extensive meditation on this major figure in postmodern U.S. fiction.